A green log woodturner looks at a log and decides what bowl is hiding in that log that he can reveal. A segmented woodturner decides what he wants to make. He draws up a sketch, and decides what colored woods he wants to use to create the “effect” that he is looking for. The greatest deterrent working against someone who tries his hand at segments woodturning is getting the precise angles consistently in cutting the segments. All segmented woodturning is based upon the 360 degrees of a circle. 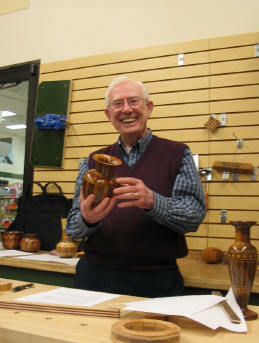 First you start by making a drawing of the bowl or vase that you want to create. Decide where you want the different layers of segments to be on the turning. Then decide the number of segments you want to be in each layer. I usually use 12 segments in my turnings. If you use 12 segments, each segment has 2 miter cuts of precisely 15 degrees. So that makes 30 degrees on each individual segment. 30 X 12 = 360 degrees. Any other number of segments can be determined with this same math. 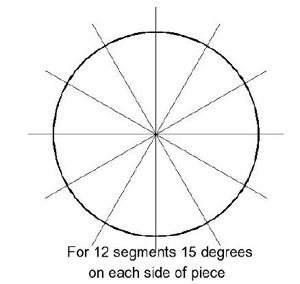 From the drawing and a circle chart, you determine the size of each segment. I use the New Nova Chuck with four different sets of jaws. I also have a Cole jaw chuck for my new Nova Chuck. This chuck has rubber protectors that screw into the chuck, and opens from about 3" to about 10". It is great for reverse-chucking bowls for fancy turning on the base. Once I have a bowl or vase in my chuck, I always mark the exact placement of the waste block in the chuck, so whenever I remove it and place it back, it will be centered because it is in the exact same place on the chuck jaws. I have a new way of centering each layer on the layer below it. I turn the next layer separately on my Nova Chuck to exactly match the outside diameter of the immediately lower layer, thus insuring that it is centered. Then, I glue it up off the chuck. Segments can be cut on the table saw using a jig that holds the long piece you are cutting into segments at the correct angle. This jig can be made of wood, or it can be a purchased metal jig. Some people also use a chop saw set at the precise angle. I use the Incra Miter 1000 metal jig for cutting my segments up to about 2 inches high. Higher that that, I rip them by tilting my saw blade. Using this method, I usually cut longer pieces in order to be able to cut 3 or 4 segments out of each piece. 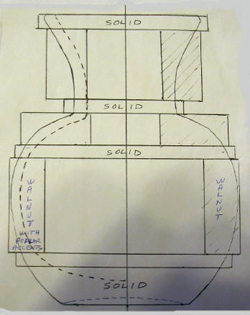 Again I use the measurements I previously discussed on determining the length width and height by the use of the circle chart. 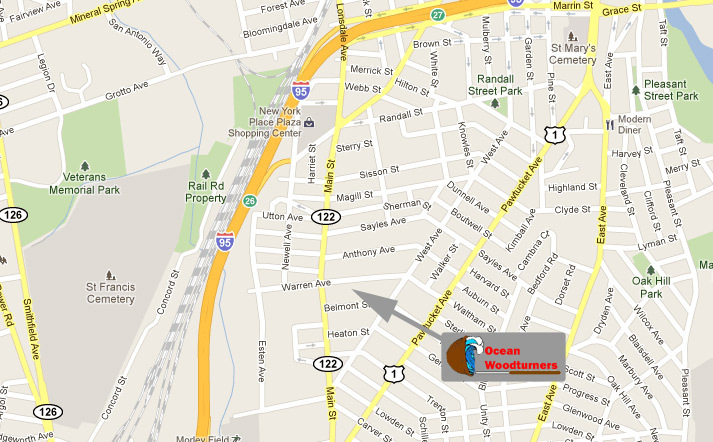 (Explain here the flipping over of the piece ripping or cross-cutting in order to minimize wood wastage. To set the angle of the saw to the precise angle, I have a piece of 1/8” white plastic cut at exactly 15 degrees. I hold it against the saw blade between the carbide tips on the blades. I shut off most of the lights and shine a large flashlight behind the plastic piece as I adjust the blade angle until the light is completely blocked. I find this method to be very accurate. You get some very surprising effects by laminating contrasting woods that can then be cut into segments. You must make the lamination identical from each side to the center or middle, so that segments cut from each side will be identical. I use laminations very often and love the effects I can get. The grain orientation should always be the same on the turning. If you use spacers between the segments, these should have the grain orientation the same as the segments otherwise the end grain placed between long grain will eventually fail due to the amount of movement of the end grain in relationship to the long grain. I often use spacers laminated with dark against light woods for contrast. I have a Performax open- end 16-32 drum sander. After gluing up a layer, I sand both sides of each layer, so they will be uniform. I do lightly turn the upper side of each layer to insure that it is true and flat before gluing on the next layer. I think that Performax is the best open-end drum sander on the market. I used to feel like I was cheating when I would hollow the inside of a bowl when I reached the widest point, but when I saw that Ken Dubay cuts off the top of his green turned bowls to hollow out the inside and then reattach the top, I didn’t worry about my method again. So, I hollow out the inside of the turning before I glue on the next layer. When I get to the widest point of the bowl, I even sand and finish the inside. I have tried various sheens of Minwax Polyurethanes over the years, but am now using 2 coats of white Shellac as a primer, then sanding , followed by a few coats of Salad Bowl Finish put on with a smooth rag. Both shellac and salad bowl finish dry fairly quickly and look good.